Join Emyo Seien Darlene Tataryn as she guides you through subtle and powerful techniques of working with breath and body. Consistently practiced, these methods will lead you to a state of peaceful calm abiding - the imperturbable stability of natural mind that is your birthright. For the month of November 2018 Darlene will be resident meditation teacher at Dharma Treasure Retreat Center in Arizona. 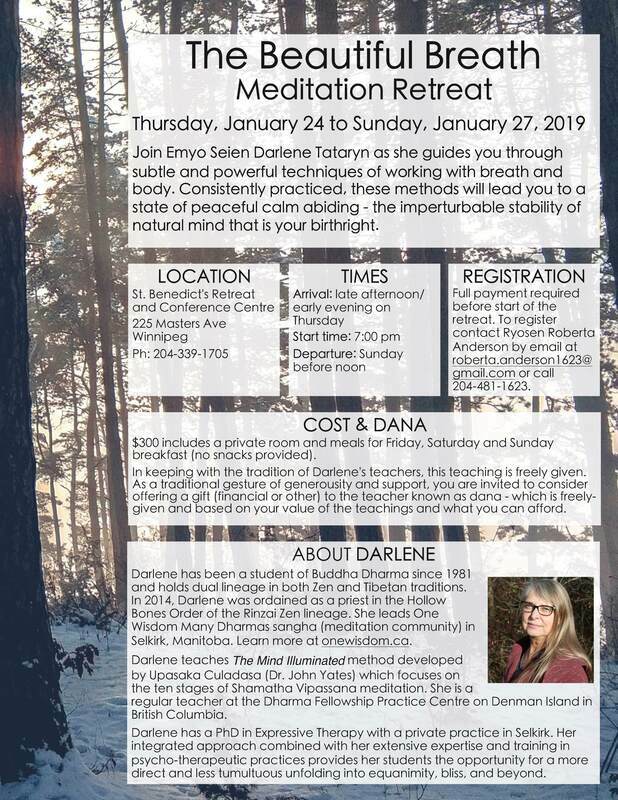 Please contact ndarlenetataryn@mts.net or contact the retreat center directly to join Darlene and other practitioners. This is a wonderful opportunity for meditators at any stage of practice! Come for a week or two or more and receive individual support and guidance through the various stages of meditation. 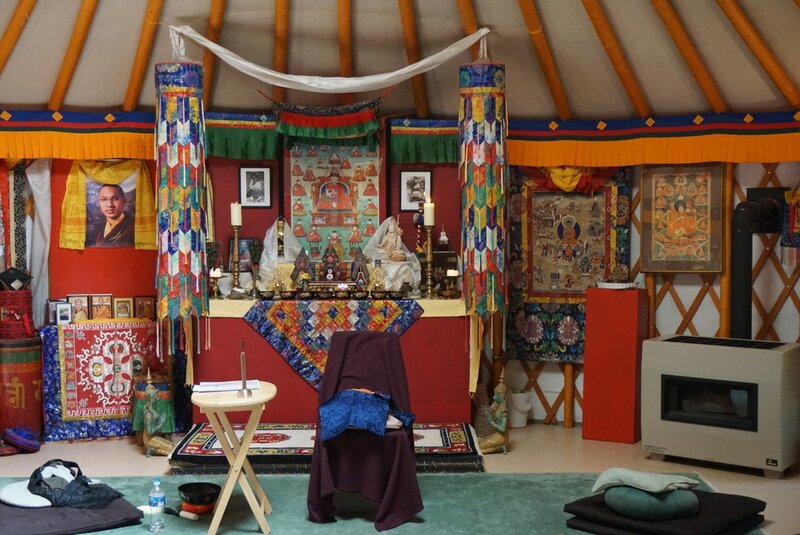 Retreats with Lama Lodro are unique because attendees can set their own dates and personal schedule. There will be group-lunches, karma-yoga practices, group meal prep and plenty of opportunity for personal practice and reflection. Some days will be more active than others, depending on what events are being held that day. For those participating in a 7-day retreat, we are asking for a base rate of $350.00 plus Dana for Lama Lodro. It's shared accommodations between various couches and sleeping matts through-out the house. For those coming to daily sessions and staying for a meal, please donate a $12.00 to help us buy all the fresh food and snacks! A general rule of thumb for all dharma activities is $20.00 for the temple, $20 for the teacher. Of course, we ask that all participants participate in Karma-Yoga. For those who are dedicated to practice, but have limited funds, worry not! We have plenty of extra- preparation and clean up for you to help with. ​EMAIL ALEXANDRA.TATARYN@GMAIL.COM TO REGISTER OR ASK QUESTIONS. 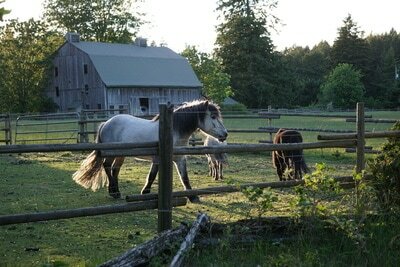 Visit lamalodra.ca for more info on the teacher. AND INCREDIBLE WRITE UP ON DIETY PRACTICES. Living a conscious life is not an accidental process. ​It is a material and spiritual art form that requires the observation and application of a scientist and the focus and steadiness of a martial artist. It requires a heart willing to open and embrace kind acceptance toward both self and other. We consciously cultivate an awakened ego function able guide our thoughts, feelings, and emotions toward our deepest intentions within the flow of Tathagatagharba, this inherent transcendental essence. We do this through identifying our innate Pure Awareness and the objects that capture our attention. With these simple injunctions we can learn to find freedom in a moment to choose our responses to self and other that are conducive to well being personally and in relationship. This experiential retreat will overview fundamental Buddhist viewpoints and history in the context of Hollow Bones Mondo Zen Koan process. Mondo Zen is a meditation system of koan inquiry based on Japanese and Chinese Zen updated for this century and western culture. What is a koan? A koan is a question designed to bring about direct experience of awakened mind. Each of the Mondo Zen koans deconstruct and reconstruct our philosophical orientation so that we might lead a life informed by deep clarity and heartfulness as we meet our self and others in the world. You will receive direct pointing out instructions for natural mind realization as well as clear and complete meditation instruction which lead to deep calm and life affirming insight. Your individual and group experience will include an exploration of insight, practice, and emotional koans which help us identify and work with arising feelings, emotions and mental states and their enactment. Embodiment practices such as Qi Gong are a part of our daily program. As your Guide, I look forward to meeting you, sharing in Buddha Dharma, and offering personal interviews. 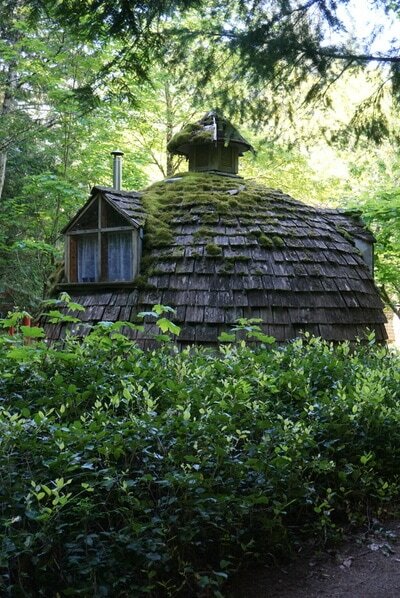 Regardless of your prior experience, rest in beginners mind and a willingness to open into your deep caring and life concerns in the context of this beautiful rustic retreat setting and ocean within walking distance. Food and Accomodations: 300$ to 510$ based on selection. In 1981 Darlene stepped fully into Buddha Dharma as a student of Theravadin lay monk Kema Ananda and since his passing has been a student of other valued teachers in the Karma Kagyu Nam Gyal lineage in Canada. In the Zen tradition she has taken Jukai and in 2014 has been ordained as a Priest by 83rd Zen Patriarch Jun Po Denis Kelly into the Rinzai Zen Hollow Bones order and given the names Emyo Seien (Gift of Clarity/ Pure Circle). Over the years Darlene has woven Integral Theory into her life and practice. She has facilitated spiritually oriented groups and facilitated meditation programs, instructed Applied Counselling for Red River College Gimli Campus for seven years, maintains a private counseling and somatically based expressive psychotherapy practice, and enjoys being married with four wonderful, now adult, children. 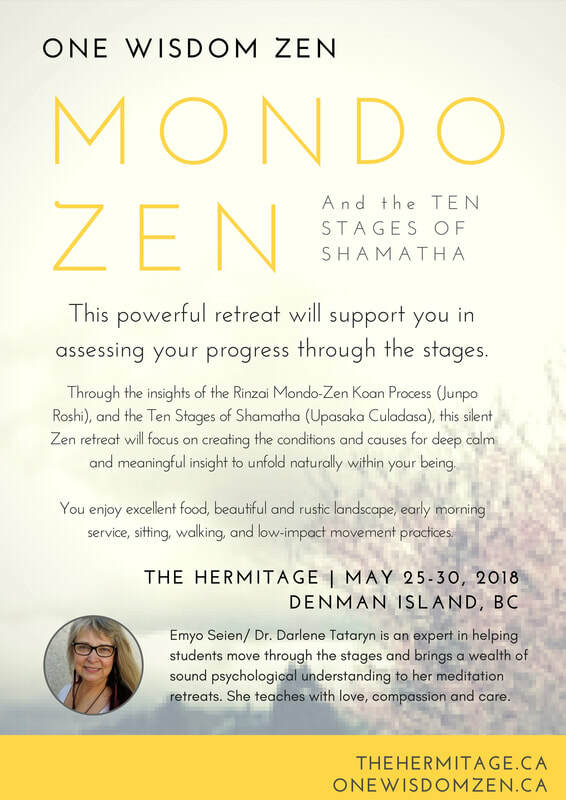 Welcome to the first Mondo Zen retreat, with visiting Roshi, in Manitoba. Taking place at the Selkirk Vihara, 1/2 hour north of Winnipeg, this urban retreat is for beginners and experienced practitioners alike. ATTN: Roberta Anderson at info@onewisdommanydharmas.com for questions and registration.